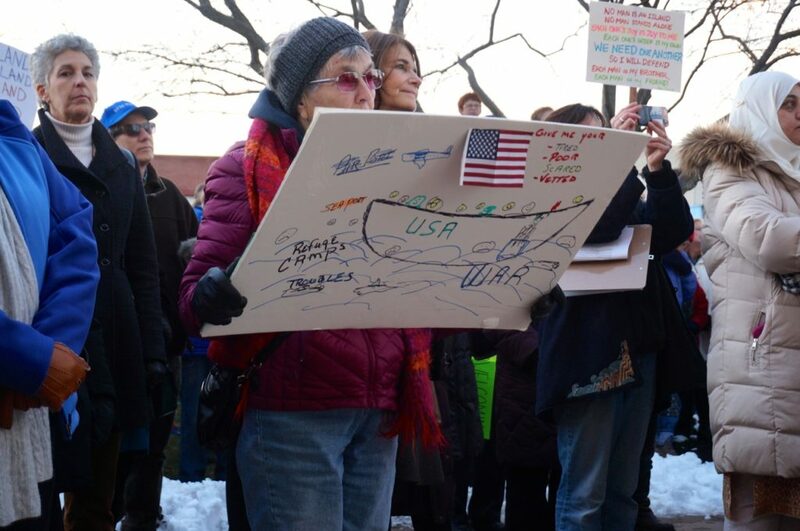 A crowd gathered in front of the steps of West Hartford Town Hall on Wednesday, expressing their support for immigrants and refugees in the community, and vowing to continue to protect their rights. 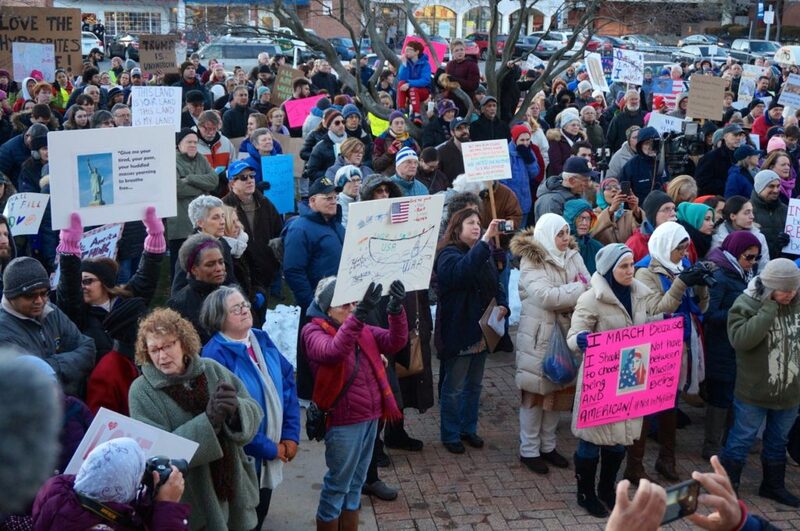 A spirited but peaceful crowd came together Wednesday in West Hartford Center in support and solidarity with Muslims, refugees, and all immigrants. 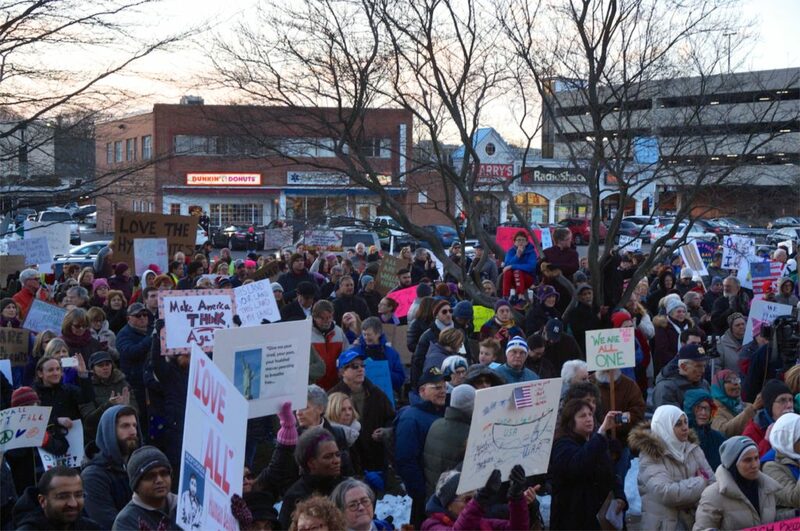 As darkness fell, the crowd at the base of the Town Hall steps grew to an estimated total of 1,100 people – one of the largest rallies in West Hartford’s recent history. 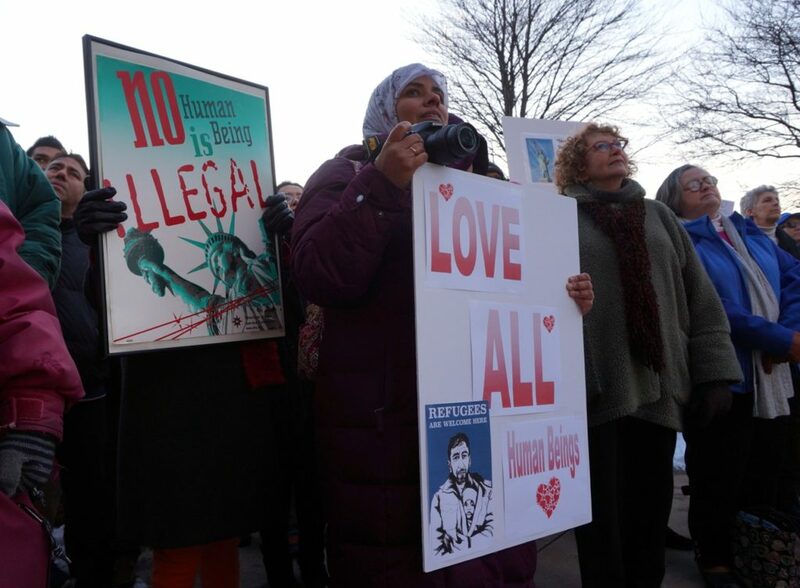 Attendees waved posters, listened to speakers, chanted and sang, and vowed to continue to support immigrants in the community and throughout the country by taking positive action. They were young and old, male and female. 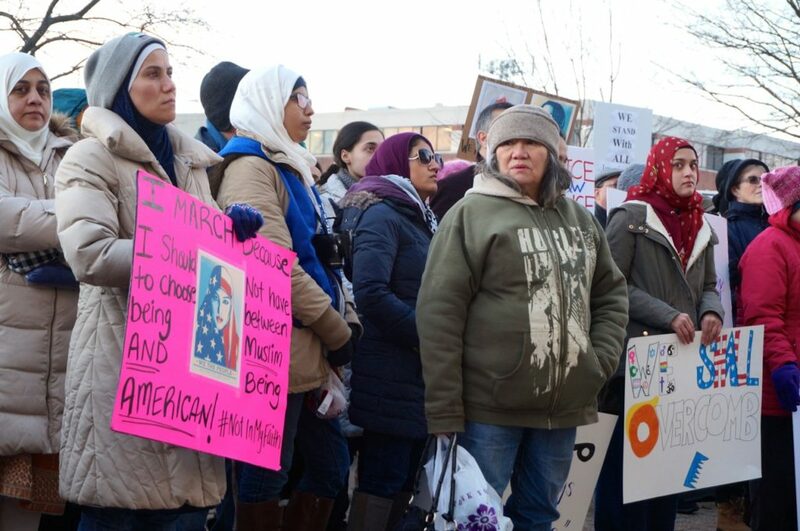 Many wore hijabs as part of their regular attire, while others wore them in solidarity. The event was co-organized by Mark Overmyer-Velazquez, chair of West Hartford’s Board of Education, a history professor and director of El Institute: Institute of Latina/0, Caribbean, and Latin American Studies at UConn, and UConn political science professor and director of Middle East Studies Jeremy Pressman. 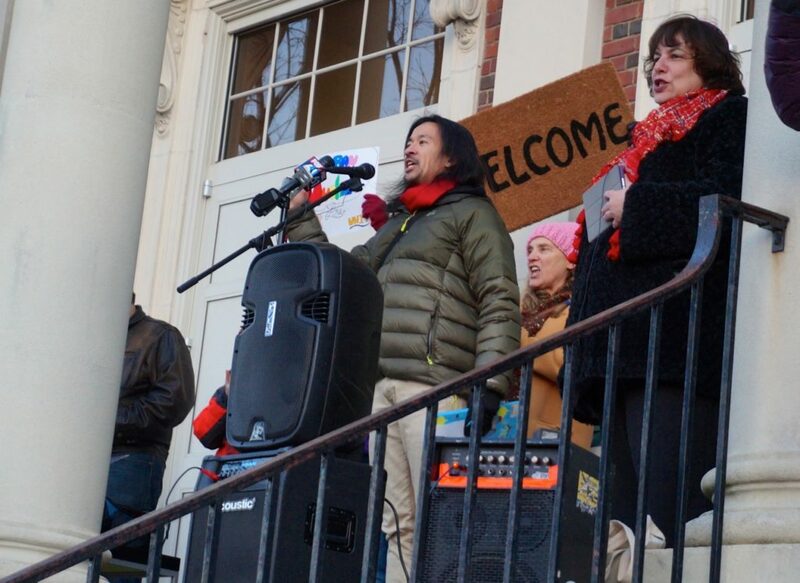 Overmyer-Velazquez served as emcee for the rally. 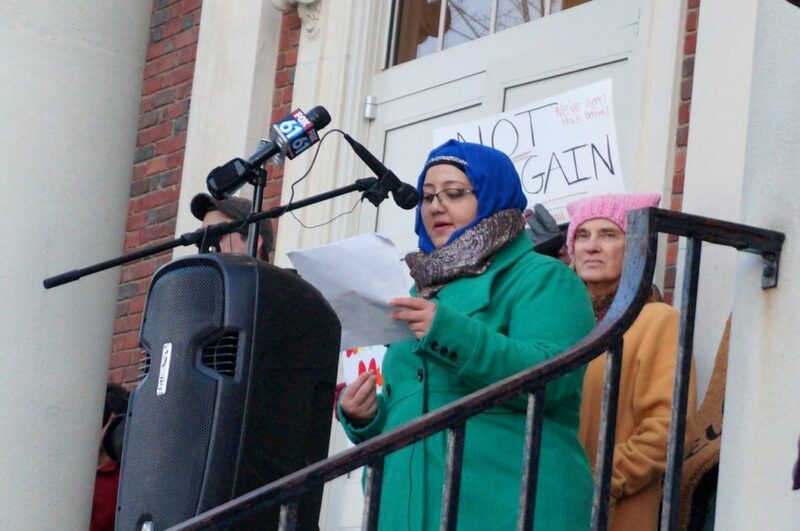 Speakers included West Hartford Mayor Shari Cantor, former South Windsor Town Council Member and former Mayor Saud Anwar, Rabbi Debra Cantor, Muslim Coalition of Connecticut Director Samia Hussein, Hall High School student Gabriela Valdiglesias of Connecticut Students for a Dream, Mobashar Akram from the Board of Directors for the Islamic Center of Connecticut, Rev. 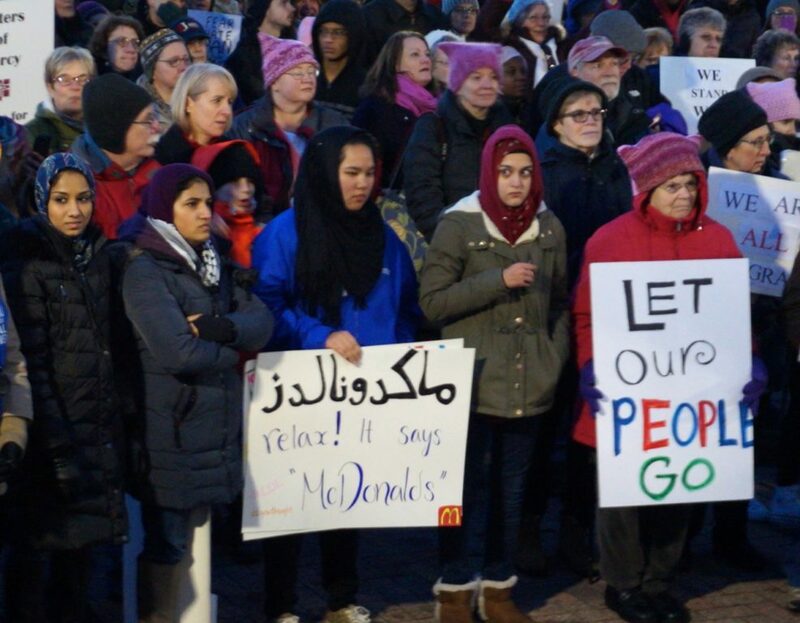 Cathy Rion Starr of the Unitarian Society of Hartford, Hartford Mayor Luke Bronin, Amer Nabil from Islamic consulting firm Common Ground Services, and Maria Khan from the University of Hartford International Student Services. 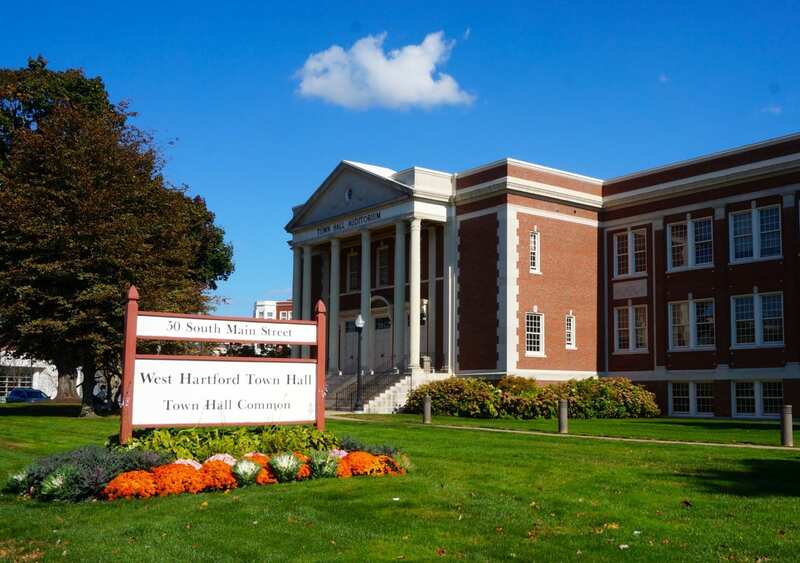 “West Hartford is proud to be a diverse community,” Cantor told the crowd. 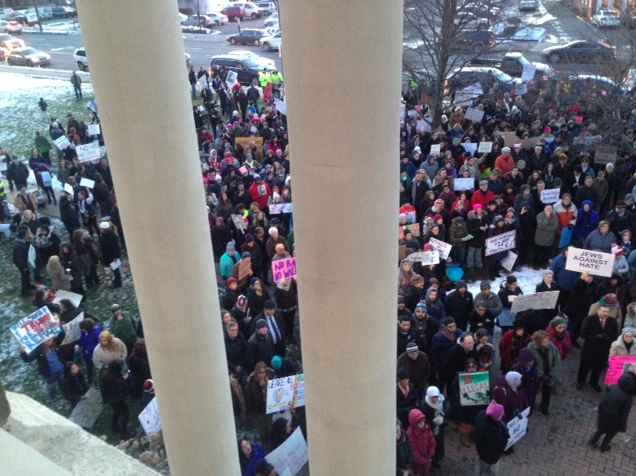 Cantor said she has been uncomfortable, ashamed, exhausted, and angry about the executive order issued by Pres. Donald Trump on Friday. That order restricts the country’s immigration policy by suspending entry of all refugees for 120 days (and indefinitely for Syrian refugees), and blocks entry for the next 90 days to all nationals of Iran, Iraq, Syria, Sudan, Yemen, Libya, and Somalia. 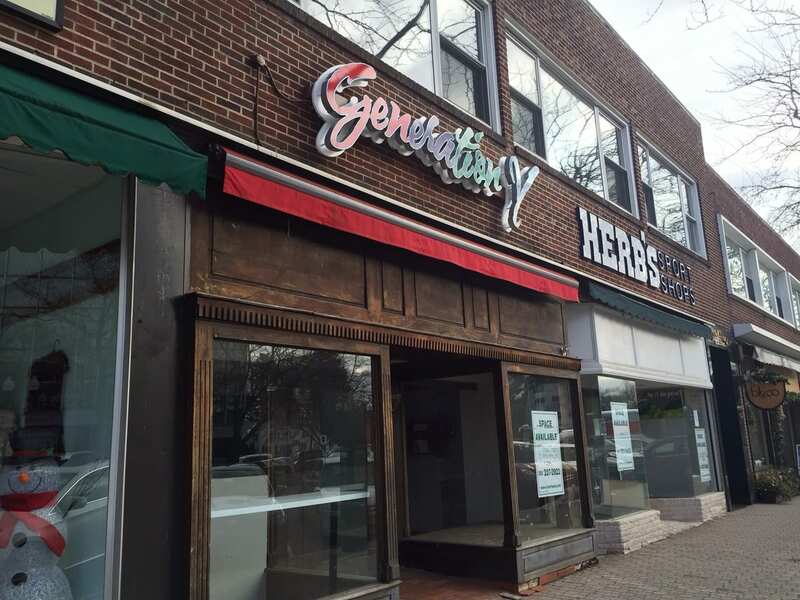 “This is not who we are, we are better [than that],” Cantor said. 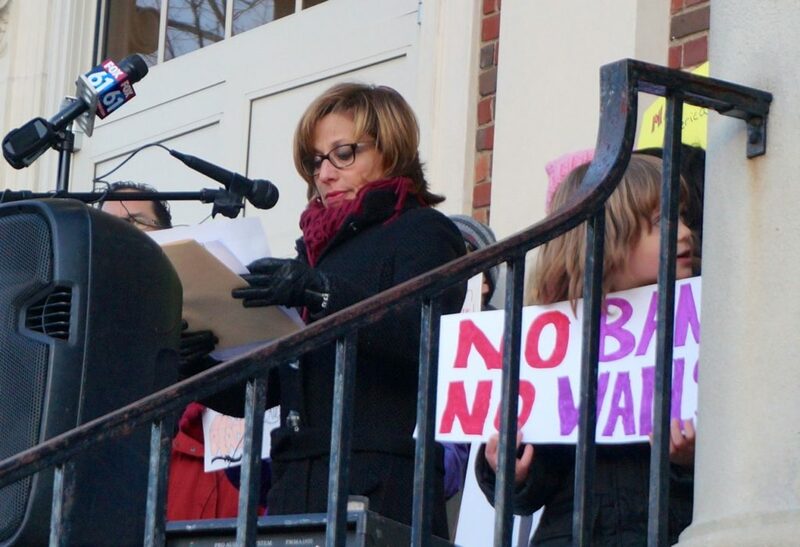 While she fears that the ban will have dire safety consequences for the nation, she said that rallies like this energize her and give her hope. “We can never take our freedom and peace for granted,” said Cantor. 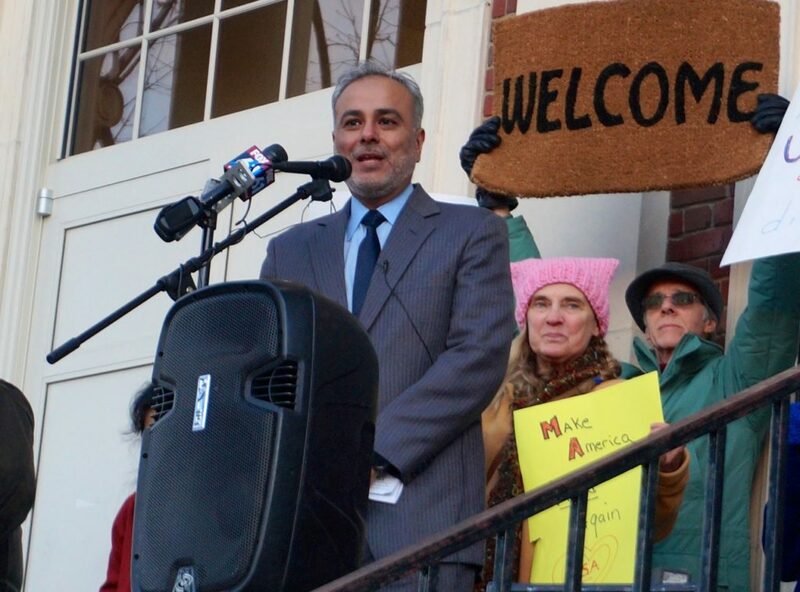 Anwar, a physician, was the first Muslim elected mayor in Connecticut. He said he fears that Pres. Trump’s actions and words will be used by ISIS to recruit more terrorists. “We the people will remain strong and we will resist. That, my friends, is a fact,” Anwar said. Some members of her family came to the United States to escape the Holocaust. Others who were left behind perished, Rabbi Cantor said. “We Americans close our doors to the rest of the world at our own peril,” she said. 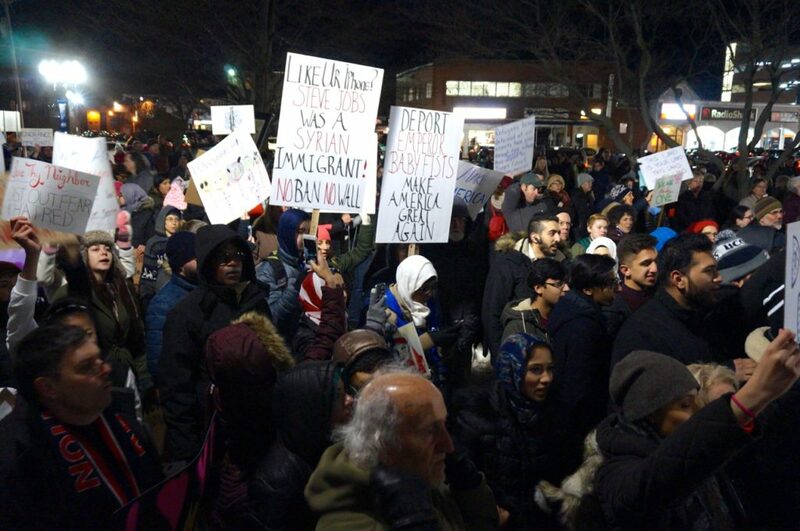 “What makes our country unique is diversity … Immigrants and refugees have helped build this country,” Hussein said. The speeches were occasionally punctuated by chanting and cheering. 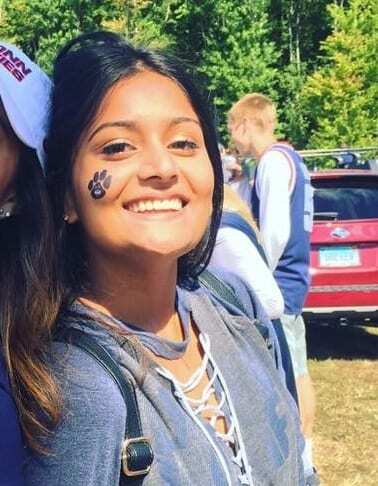 Valdiglesias, a student at West Hartford’s Hall High School, said she is an undocumented immigrant. She told the crowd she is fearful. 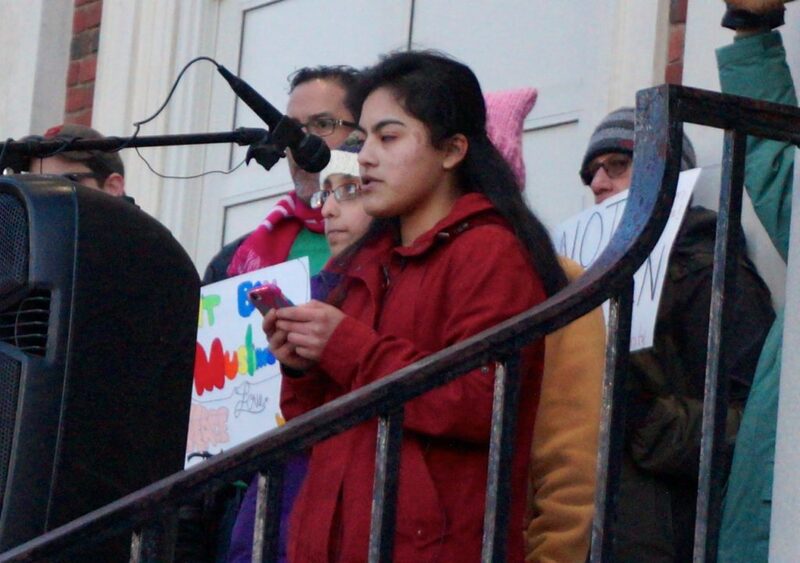 “But our message to Trump and the nation is that we will fight to prevent deportations and protect our communities … This is our home and we are to stay,” she said, as the crowd cheered and applauded in support. 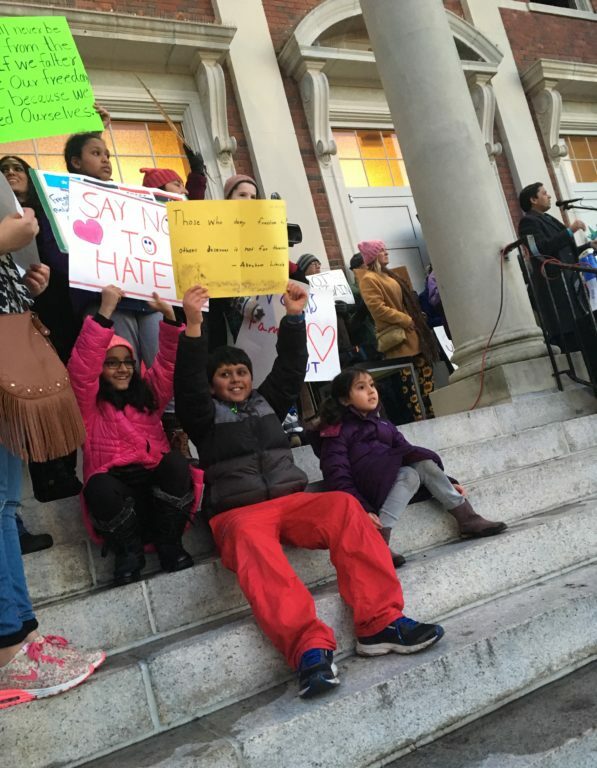 “Little children are not a threat to the United States,” Akram told the crowd. 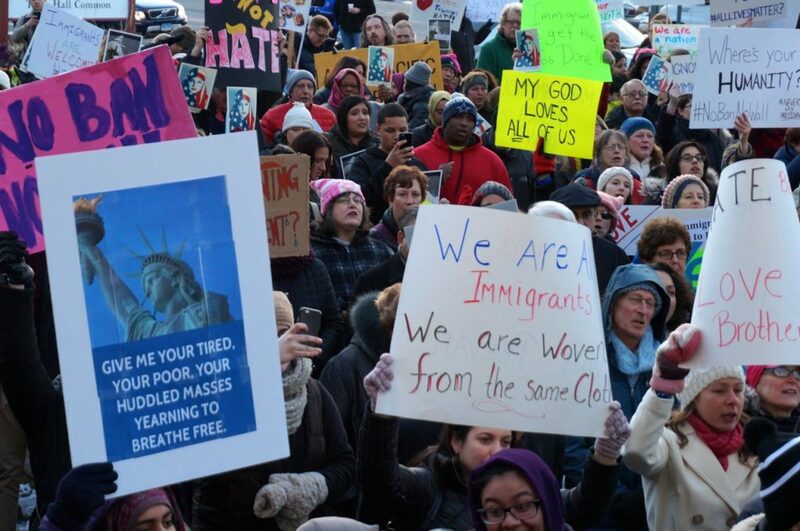 Neither are the destitute, the downtrodden, elderly grandparents, students, teachers, doctors, scientists, and others who have been detained or denied entry in the past several days. Starr said we need to learn from our history, and draw from it. 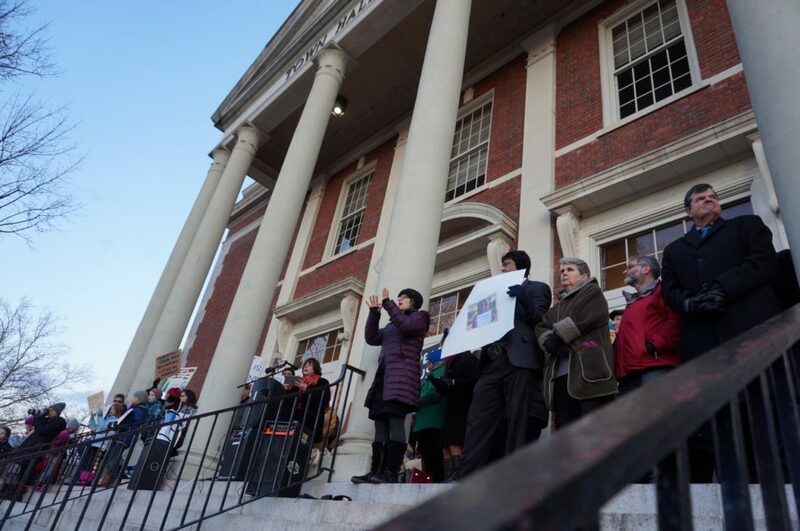 “We need to show up … we need to listen deeply,” she said. 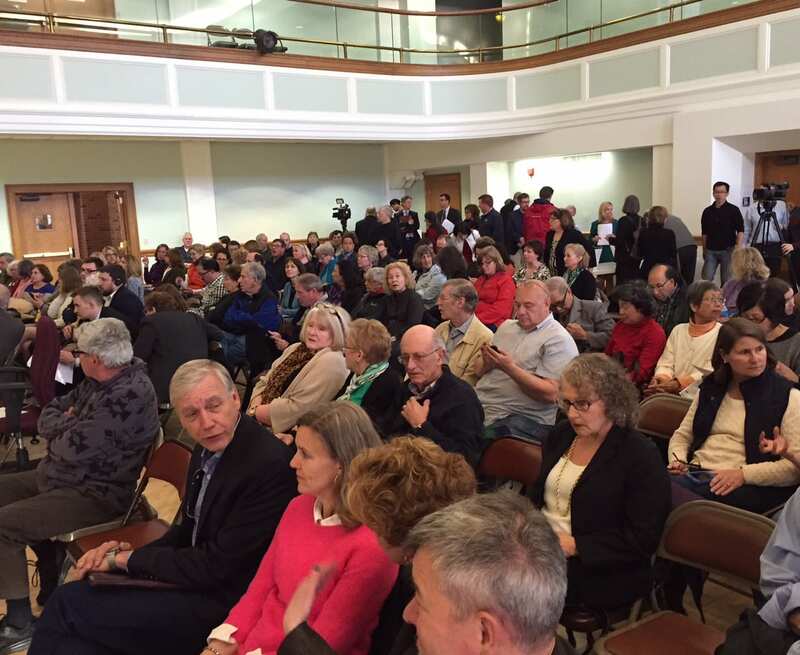 She urged people to sign a circulating petition to make West Hartford a sanctuary city. 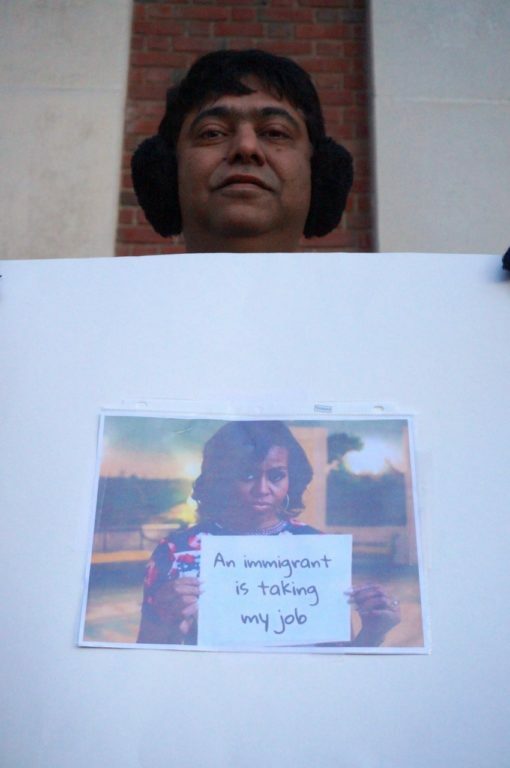 Nabil recalled how he came to the United States from Bangladesh with his parents 18 years ago. 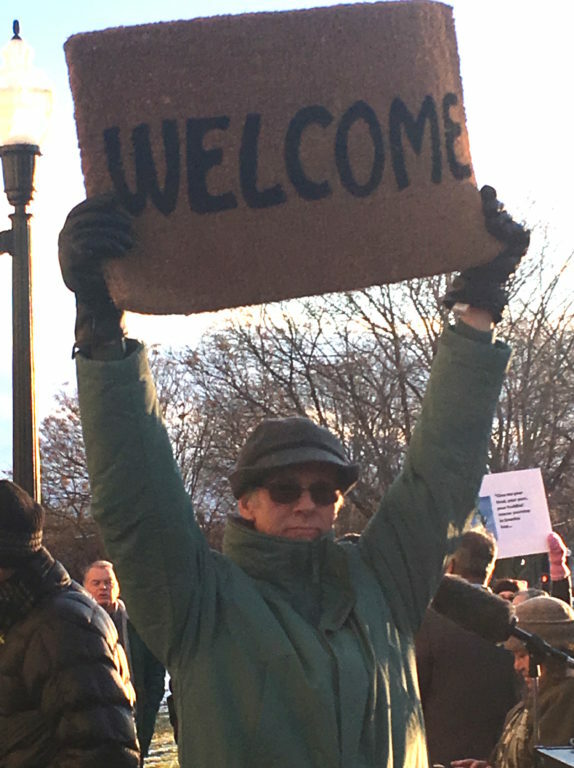 “America welcomed us with open arms,” he said, and he is thankful to be an American. 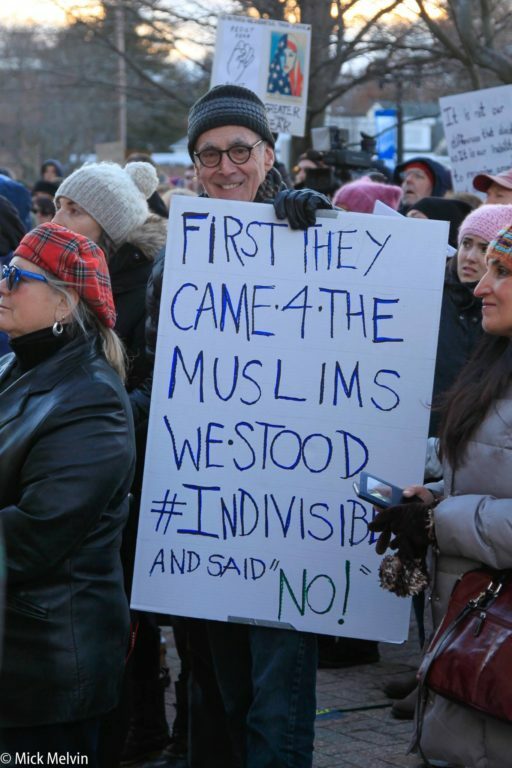 Nabil said he is grateful that he has been able to practice his Muslim faith without fear, and that faith has taught him not to hate but to be mindful and caring, and accepting of all regardless of skin color, beliefs, gender orientation, or other differences. 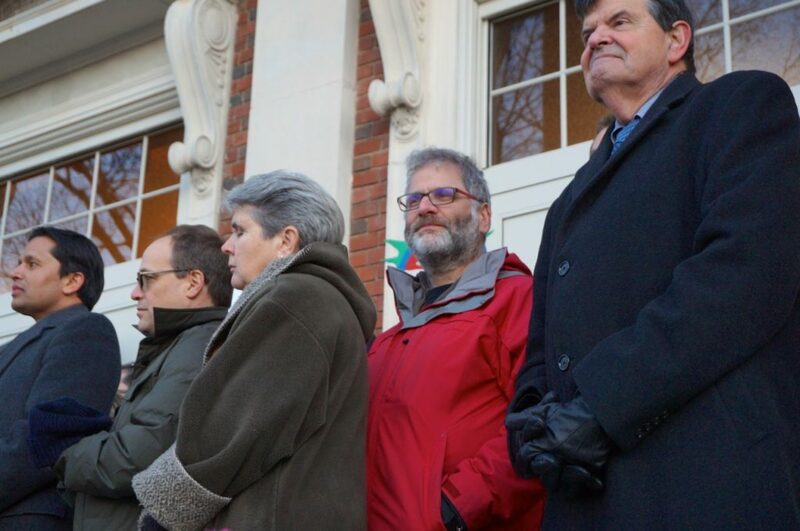 “Let’s come together and let our politicians know that we as a nation will continue to support any people … let;s stand up for justice,” said Nabil. “We are all human, we are all American, we will fight injustice,” said Khan, the final speaker of the evening. The crowd sang “This Land is Your Land,” as everyone peacefully dispersed. Information on how to take action, including contact information for elected officials, can be found in the PDF posted below. 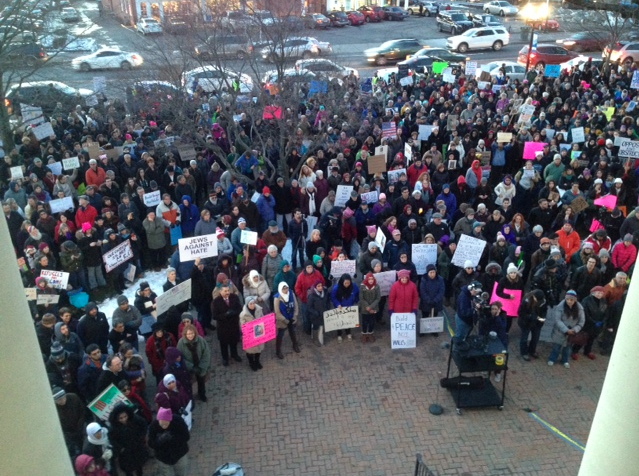 Thank you for showing that we care about the direction of our town, our state, and our country. Thank you for coming out in droves. Thank you for traveling from near and not so near. Thank you for meeting, cheering, networking, singing, chanting, listening, speaking. Thank you for making signs – clever, touching, colorful signs. 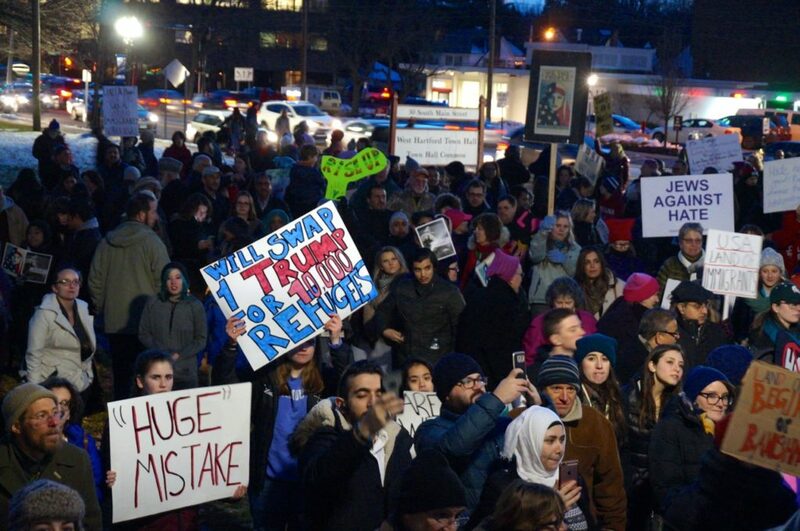 Thank you for a peaceful, uplifting rally. 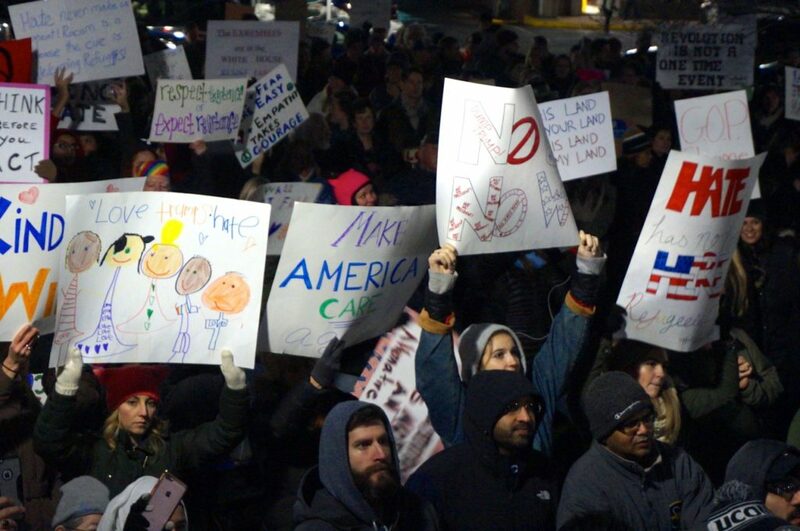 Thank you for bringing your children and showing them that This is What Democracy Looks Like. Thank you for writing postcards to our elected officials and signing the sanctuary petition. Thank you for meeting and supporting your neighbors. Thank you for coming out even though you’ve been going to rallies for decades. Thank you for coming out even though you’ve never been to a political rally. Thank you for using Snapchat and Twitter and Facebook and Instagram to spread the message. 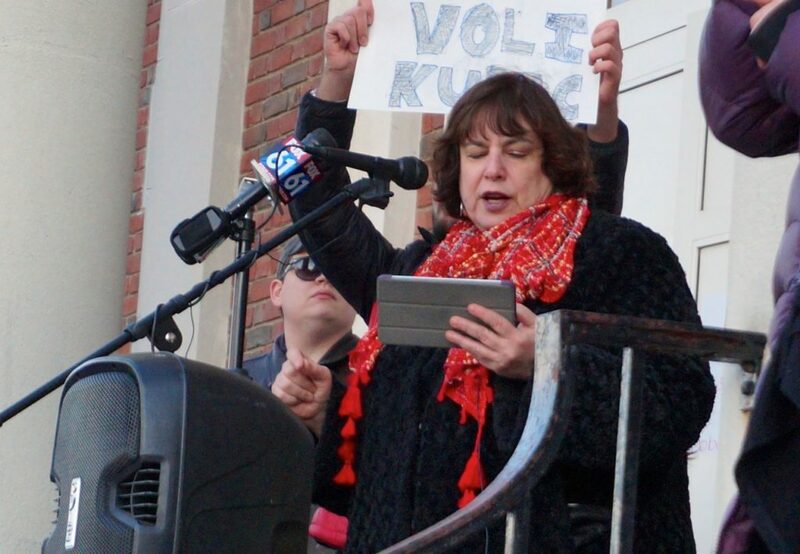 And thank you for taking seriously that this was just one step and that we must continue to write, call, visit, rally, march, network, organize, speak out, donate, cajole, vote, and stay informed. 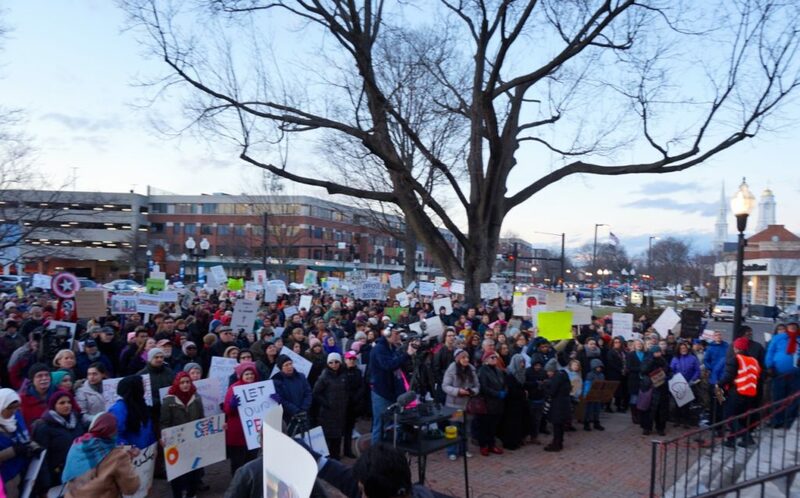 The rally was co-sponsored by the Muslim Coalition of Connecticut, Common Ground Services, Connecticut Students for a Dream, Welcome Our Neighbors, and ACLU CT.
We-Ha.com is the place to go for the latest information about West Hartford – a town that "has it all"! 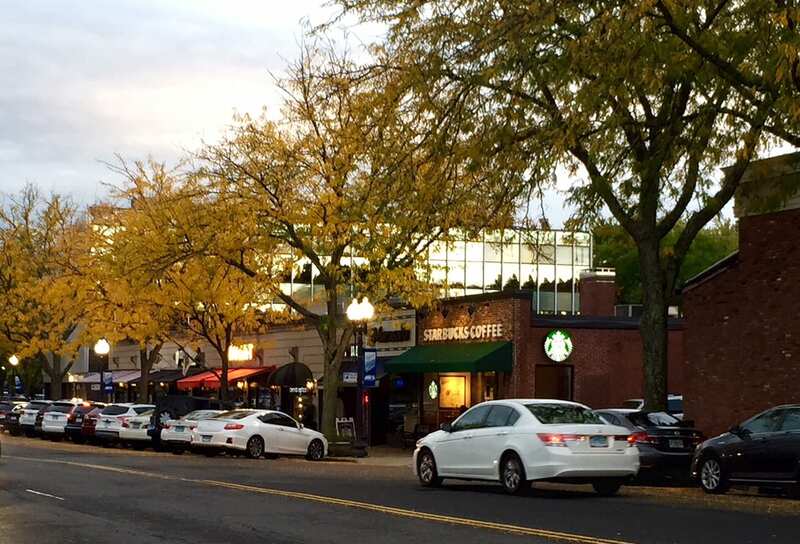 We-Ha.com is part of and proud of our community, and we bring a hyperlocal focus to news and features about the people, schools, businesses, real estate, sports, restaurants, charitable events, arts, and more. Contact us at: [email protected] or [email protected].